Review sample supplied by AudioAanZee, developer of and dealer for the AudioAanZee music servers. Almost 3 years ago I wrote the review of the original Reference Flow music server for Dutch printed magazine HVT as well as in English here on HFA. 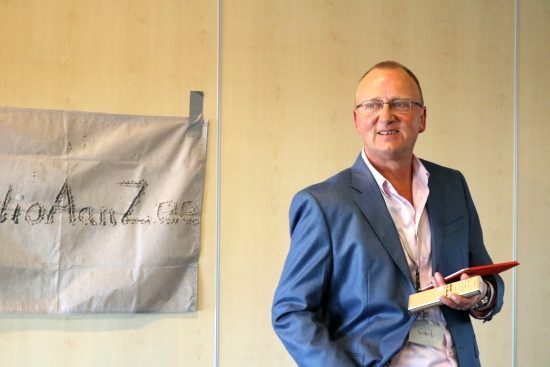 In the meantime, a lot has happened in the digital audio world and Evert from AudioAanZee has not been sitting idle, either. For those who do not yet know these servers, I will briefly describe them. 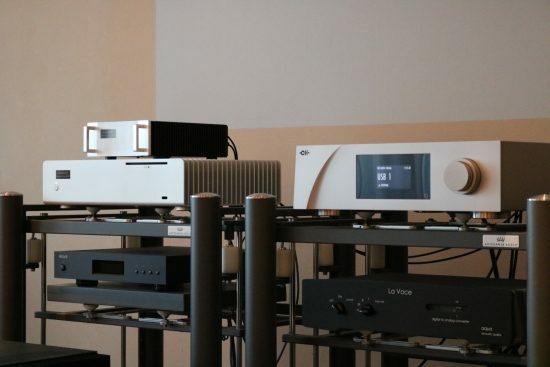 The Reference Flow is a passively cooled Roon-Ready music server with a linear power supply that with its various components is composed in such a manner to achieve the most musical sound possible. Of course, many manufacturers claim exactly the same thing and indeed “musicality” is a very elastic concept anyway, but as I soon found out, Evert’s servers really do have a unique sound. They are relaxed and have a smooth presentation that is characterized by a high degree of fluidity, and especially that last aspect made this server stand out among the other servers that I auditioned around that time, which may have sounded very detailed or open, but often also a bit square-ish or hard. In what ways does the new MKII version stand out from its predecessor? At first glance, little seems to have changed. The casing is the same and the external power supply does not seem to deviate too much from its predecessor, but appearances are deceptive: the differences are mainly on the inside. 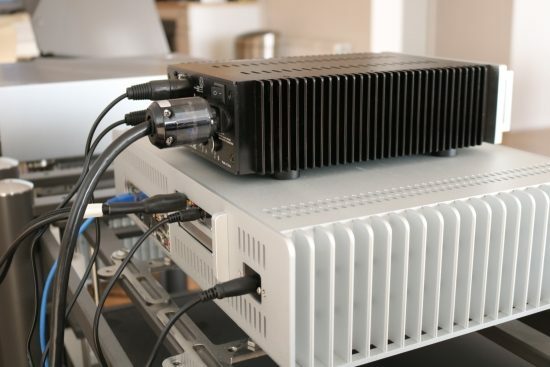 For example, the latest internal and external linear power supplies are used from HDPlex, both manufactured using only the best components, which results in very low noise values. 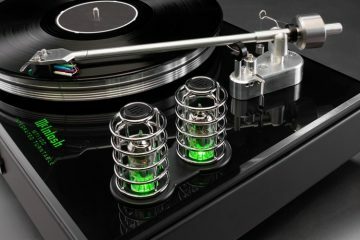 The power cables are also specially selected and equipped with beautiful Neutrik and Oyaide connectors. Finally, a separate high-quality SOtM clock is used and the internal memory has been expanded from 4GB to 8GB. Stubborn as Evert is, a spinning hard disk is still being used because he feels that it sounds better than SSD. The one used is a specially selected type that runs at variable speeds and uses little power. Opinions are divided about which type is better, but I can confirm that there is indeed a clear difference in sound between SSD and HHD. People who have built a PC from parts before will point out that you can easily build a music server yourself and that is of course correct. But before you have one that sounds as good as the Reference Flow MKII or even the MKI, you will need to conduct many experiments. You have to find that particular ideal combination of parts. How Evert does it exactly remains a mystery. Unfortunately, due to the competition, the reason why the MKII sounds so pure and “analog”, as he puts it, while at the same time having such a high resolution, remains a secret. All the power cables that I use are Belden 19365 with Bals Schuko and Oyaide 004 IEC and one of these cables is also used to power the Reference Flow MKII. 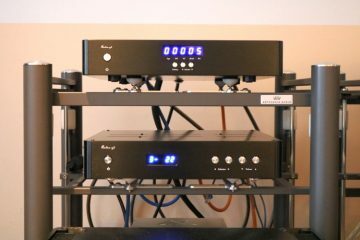 Initially, the server was listened to in combination with the CH Precision C1 DAC / Controller and the A1.5 power amp, with a Cardas Clear XLR cable in between. With this system, I will make the main assessments of the server’s qualities. Further down, I will report on other DAC combinations while using the Ayon Stealth preamp. In all cases, Roon was used in combination with music from its built-in hard disk. In all the comparisons with other servers, I have used the same collection of tracks, always copied from the same source. When side by side, you can see the differences. Left: new MKII power supply, right: MK1 power supply. The new model is taller, deeper and overall beefier. Also nice: the heatsink edges are now rounded so you’ll no longer hurt your fingers moving it. 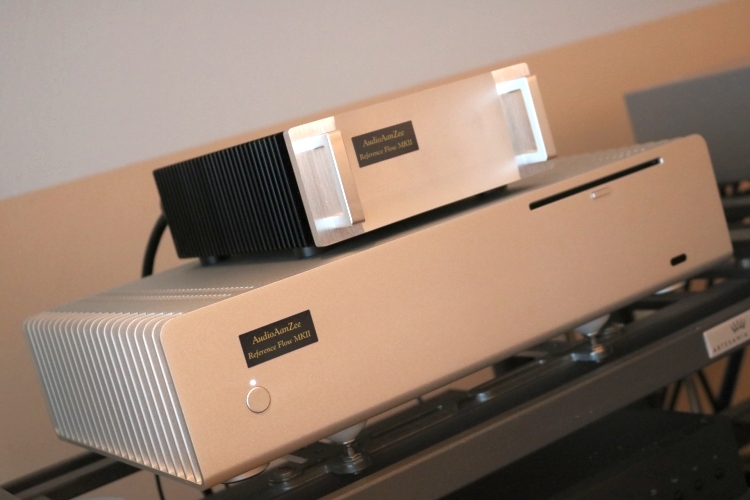 Upon first listening, it is evident that the MKI server’s warmth and relaxed fluidity are retained and in that respect, the MKII certainly shows a family character, but there has also been clear progress in several areas. For example, the MKII is considerably more subtle and refined and now has a remarkably high resolution. In that respect, the server is actually certainly performing on a reference level and it even reminds me of the refinement that I heard with the Aurender N10 when it was still my reference server. Even more impressive than the increased resolution, however, is the progress in terms of spatial imaging. There is now a deeper sound stage and a larger sound bubble around you, with more focused centralized sounds such as vocals that are not only placed tightly in the middle but also have a more physical body. The Melco N1ZH also ranks all the way at the top, certainly in terms of resolution and precision. 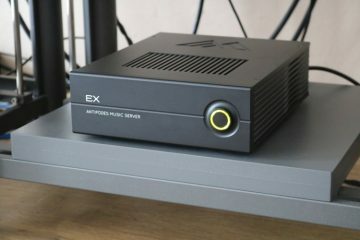 Although I think this server sounds best with a network connection, provided that the DAC offers this connection, it also performs admirably via USB. 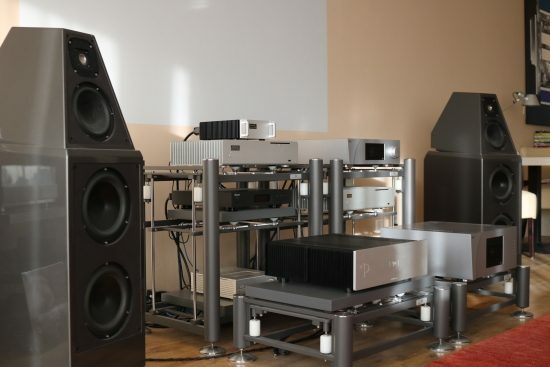 In terms of precision and speed, it goes a little further than the Reference Flow MKII, but it is also drier and more factual, and also leaner in balance, with less richness and color in the midrange. 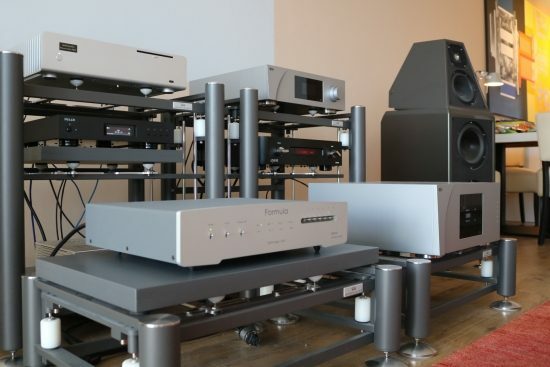 It could be said that the two servers are different but on the whole perform equally well, with the Melco being primarily an exact precision instrument and the Reference Flow MKII more a relaxed and full-bodied music machine. 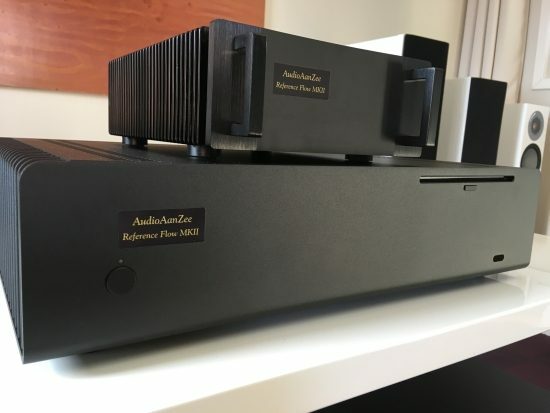 Listening to the Melco via the network connection, it is striking that the Reference Flow MKII is virtually indistinguishable from the Melco in terms of depth and spatiality, considering that I included the Melco and its network connection in my system mainly because of that very feature! 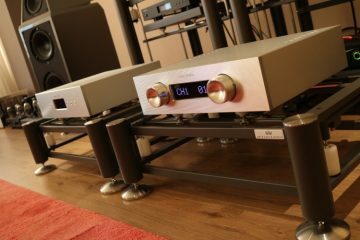 The overall presentation is still different, though: the Melco is tighter and spicier and the Reference Flow MKII is friendlier, silkier and more relaxed. 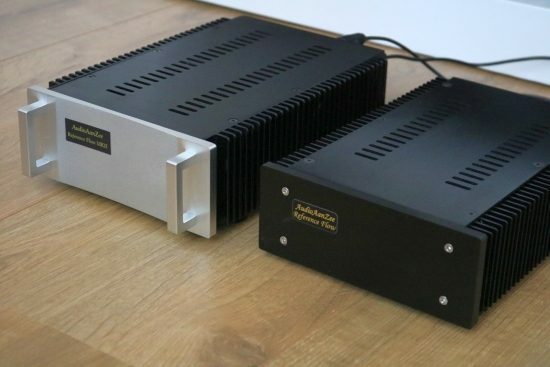 The Antipodes CX + EX combination currently forms my reference Roon server, due to its unbridled dynamics, robust “live”-like character and sonorous timbre. The AudioAanZee servers have always had a different character: silkier and smoother and more rounded, or less square-ish, depending on how you approach this. 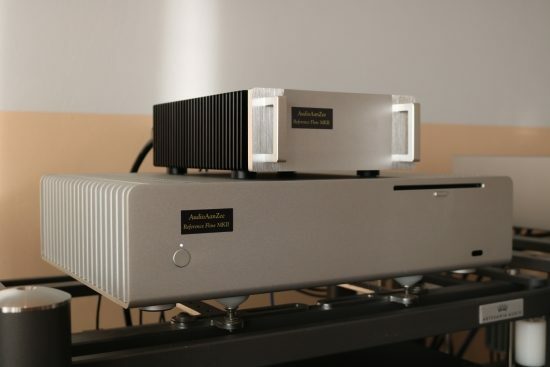 The first version of the Reference Flow was already a very pleasant server and a direct hit on a musical level, even though it could not keep up with my then reference server, the Aurender N10, in some audiophile aspects such as transparency and refinement. The new MKII immediately takes care of this, though, and is certainly at the same level in terms of resolution and refinement. What surprises me, even more, is that once again, the imaging in the depth plane and the spaciousness (the feeling of being surrounded by sound) is remarkably good and the Antipodes combi, which previously clearly excelled in this, is no longer noticeably better in that respect. What remains, of course, is the difference in character: the Antipodes is less fluid and refined, but sounds more tangibly solid and sonorous and, in my opinion, more convincingly real in terms of timbre. But what is natural? Reproduced music remains an electronic approach to reality and the factors that lead to the most convincing representation are different from person to person. Among my friends, there is also not always consensus regarding what sounds most natural. This aspect, therefore, remains more a matter of interpretation and taste than one of absolute quality. 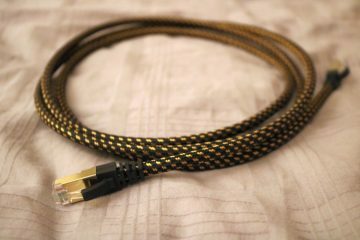 Until now, the AudioQuest Diamond USB cable has been used because of its handy 2-meter length although its character also matches the Reference Flow servers very well. But it got even better with the Curious Cable USB (livelier and spicier, without getting nasty) and the CAD USB 1 (fuller and more sonorous, without becoming too relaxed). Also, an interesting alternative was provided by the Mad Scientist Black Magic USB, which further enhances the server’s individual character with a fuller and creamier presentation. Cable choice, of course, remains primarily a matter of taste. Some people link factors such as fluidity and lack of hardness to a natural sound, while others find a solid and a sonorous timbre to be more natural. I belong to the latter group and that is why I personally find the server to combine best with the CAD USB cable. In any event, I would definitely recommend experimenting with this. For this part of the review, the C1 momentarily stepped aside to make room for a couple of other DACs, while the Ayon Stealth joined in the role of an analog preamp. 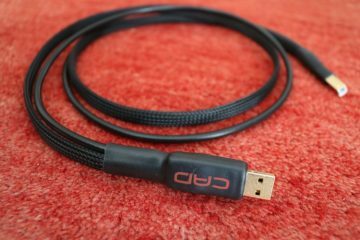 The interlink between DAC and preamp in all cases was the AudioQuest Water cinch and the USB cable, initially, was again the AudioQuest Diamond USB. 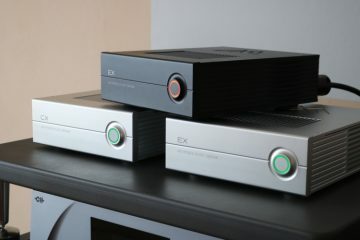 First up was the Aqua Formula xHD DAC. This remains a phenomenally good converter: very transparent but also extremely refined, it lets all the minute details be heard without ever sounding harsh or clinical. 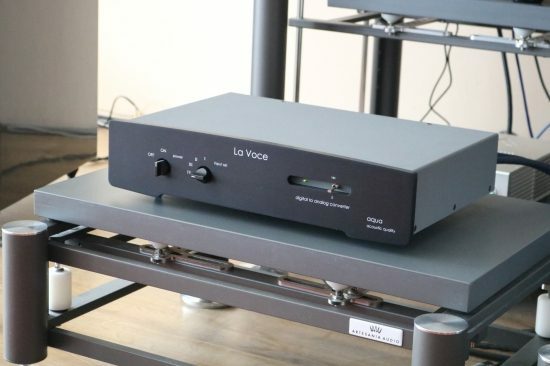 Switching to the considerably more affordable Aqua La Voce DAC (review forthcoming), the presentation was quite different. Still beautifully pure and nicely polished, but less explicitly detailed and clearly fuller, warmer, and somewhat darker. 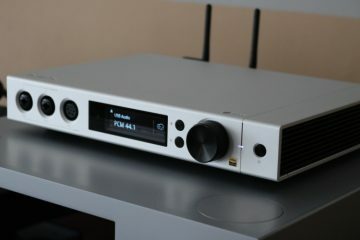 It is without a doubt a very musical sound and I must say that this DAC also combines very well with the Reference Flow MKII. 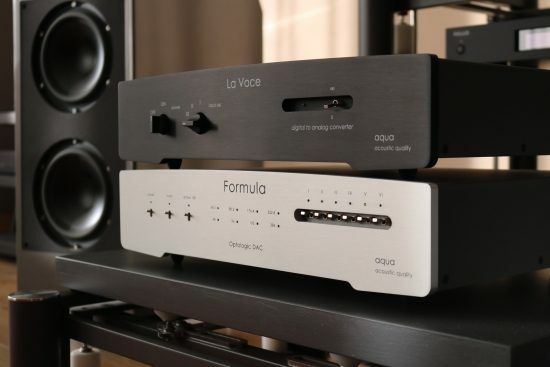 I suspect that some people might even prefer this warmer and more relaxed sound to the more transparent and precise Formula xHD, even if it can clearly be heard in a number of audiophile areas why the Formula DAC has a higher price tag. Finally, I switched to the Accuphase DP-430 CD player that Evert also brought along. 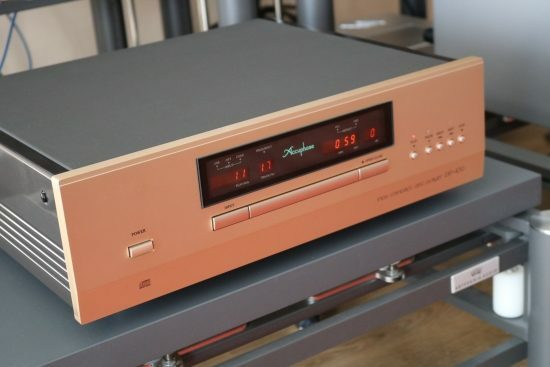 Its USB input enables one to obtain an Accuphase DAC at a lower price level than their most affordable standalone converter, with a CD player thrown in sort of as a bonus. The DP-400 also had digital inputs but only coax and TOSlink. The DP-410 already sounded a lot tighter than the DP-400 but the DP-430 sounds even more powerful. This player has a remarkably articulate and lively delivery and it makes the Reference Flow MKII produce the tightest, most precise and most articulate bass that I’ve heard this server do to date. Even when playing CD’s, the DP-430 has a decidedly explicit and immediate sound but still combined with a timbrally natural and harmonically full-bodied midrange. Although this is an impressive sound and I much like its bass performance, with the Wilson WP8 speakers, in any event, the overall balance is just a little bit too technical for my taste and I could not really get into it emotionally. When the Diamond USB was replaced with something that is pretty much on the other end of the sonic scale, however, the Mad Scientist Black Magic, this balanced out the sound very nicely, making for a good combination between precision and fluidity. While the DP-430 does not have the ultimate resolution and refinement of the Aqua Formula xHD, it does sound even more powerful and direct, which are qualities that I think will impress many listeners. 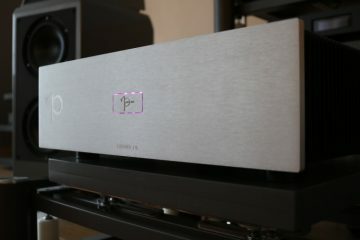 As you can see, the Reference Flow MKII has a certain character but depending on the accompanying DAC, the sound can be steered in any direction. The difference is not subtle: the Reference Flow MKII is improved considerably compared to its predecessor. 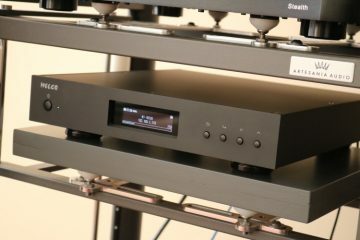 Although every music server has its own unique character and presentation, the Reference Flow MKII now performs at the same overall level as the equally expensive Melco N1ZH and in a couple of areas, it even performs on the same level as the more than twice as expensive Antipodes CX + EX combination.